Those strange words had a profound affect on my childhood growing up in Fresno in the 60s. I think Channel 47 had only three movies in its library ... ones that seemed to play every Friday night on "Science Fiction Theater" at 7:30: "The Day the Earth Stood Still", "Them!" and "The Thing (from Outer Space)". On those Friday nights when I was 9 or 10, my younger sister Sharon and I would huddle together in the living room, watching giant ants take over Los Angeles or cringe as aliens landed in Washington D.C. or terrorized scientists in the North Pole. 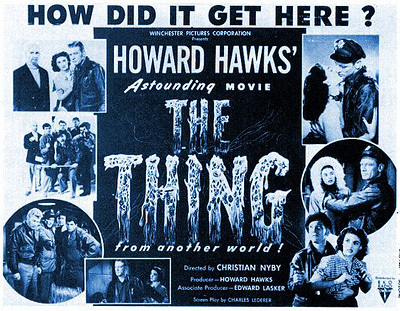 For those not familiar with these movies, they are all fairly typical of sci-fi movies made in the early 50's: low budget special effects, the military blasting away, undertones of the Cold War and ... plenty scenes that were dark and grainy looking. All of these movies have a common thread, a dark and moody "noir-ish" look to them. Years later, learning about photography and emulating my idols at the time, W. Eugene Smith and Josef Karsh --- dunking film in D-76, dodging, burning and using potassium ferricyanide to bring back the shadows in my photos I would think about those old sci-fi movies. 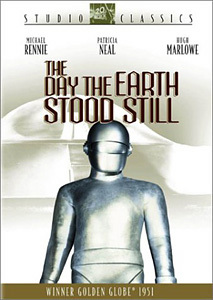 The most noteworthy and interesting of the trio is "The Day the Earth Stood Still" with Michael Rennie and Patricia Neal. Rennie plays the alien "Klaatu" who lands on earth and is shot by the over-anxious military while trying to deliver a message of universal peace. "Klaatu" later escapes from the hospital and lives among us humans, in a boarding house with Neal and her young son. The message of paranoia, military might and bigotry is one that didn't escape me ... even at 9 or 10. Trooper. 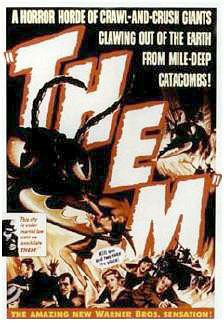 The giant ants flee the desert near Las Vegas and eventually take up residence in the Los Angeles water system. I still can't drive down Interstate 5 near Glendale where the concreted-over Los Angeles River runs without hearing in my mind that high-pitch noise "Them" made when they were about to eat some unsuspecting human! The "noir-ish" of the bunch has to be "The Thing" ... with it's overhead bare bulb lighting, shadows on the walls making you jump at every turn and grainy, dark feel. When I think back to those movies and that time in my life, it seems maybe cinematographers and directors were looking at the pages of Life magazine for the "look" of their films. Shadows played across the pages of leading photo magazines, as well as the screens of movie theaters of the 40s and early 50s. Movies borrowed techniques from the leading photographers of the time ... or maybe it was the other way around? A few days ago I exchanged emails with a few college students concerning a gallery of black & white photos I had up on SportsShooter.com. A couple of them asked about the film I shoot and whether I used auto-focus (heck, some of the photos were nearly 20 years old!) ... and one asked who my inspiration was during my college years. But instead of naming Smith and Karsh ... I told them to head to Blockbuster and rent the three films mentioned above, plus Alfred Hitchcock's "Rear Window" and "Psycho". That sure must have given them a laugh! Yes it was simpler time ... super heroes were just on the pages of comic books, movie special effects were actors in funny looking rubber suits and there was no auto-focus or TTL flash. The other day I was talking to Robert Beck, asking how his son was doing after his unfortunate baseball mishap. We eventually got to talking about movies and how it's tough these days to find something interesting and good to show our kids, as well as enjoy too ... but isn't filled with gruesome looking 50-foot man-eating dragons, half-naked people or mindless car chases and gunfights. I can recommend all three of these films ... they can be enjoyed by you and your kids (though they may laugh a bit at the primitive "special effects"). So head over to your local video store like I told those college students and check out those old films ... Life magazine and photojournalism maybe dead ... but "the look" lives on, at least on DVD! I think after all of these years I have finally figured out what "Klaatu barada nikto" means: 1/ 60 @ 2.8 on Tri-X pushed two stops! - You couldn't have missed it, but in case you've been hiding under a rock in Baghdad, we recently announced that Vincent Laforet of the New York Times has joined the faculty for the Workshop & Luau. Vince will be talking about his work the mind set for taking your everyday assignments and turning them, into something special. - While the Workshop & Luau's official program ends at 6pm on Saturday (Nov. 7) there will be another one-on-one portfolio review session that night. It will begin around 8:30 and run through midnight. I know many people have expressed a desire to book flights home Saturday night and that's fine. This is just another opportunity to have your work looked over by members of the workshop faculty and staff and make those important networking contacts. - A few of the great breakout classes we are offering are nearing their room capacity limits. We will be closing them off soon, so if you're still trying to decide to attend the Nov. 7 - 8 Workshop & Luau and want to have a choice of all of the breakouts, better register on-line soon! - For our non-students, you have 21 days after completing the on-line registration from to get your check mailed to our Post Office box. As I mention above, we have several classes nearing capacity, so it would not be fair for me to hold a spot for you and then you not pay. - And yes, I still have a couple of more announcements to make! (Think "contest" and "trade show"!) For details on all of the speakers and classes, check out the Workshop & Luau page on www.sportsshooter.com. One reason I started Sports Shooter was I wanted to give photographers a chance to tell THEIR stories. This month we have two reports from the Colonial where Darren Carroll and Robert Beck report on covering Annika Sorenstam becoming the first women in over 50 years to play a PGA event. Randy Vanderveen writes about how an international news story affects a small community and Rhona Wise gives us a back stage look at covering an entertainment awards show for the first time. So sit back, adjust the volume on the Beatles-A-Rama Internet radio station ... adjust the contrast on that computer monitor and enjoy Sports Shooter v.55!